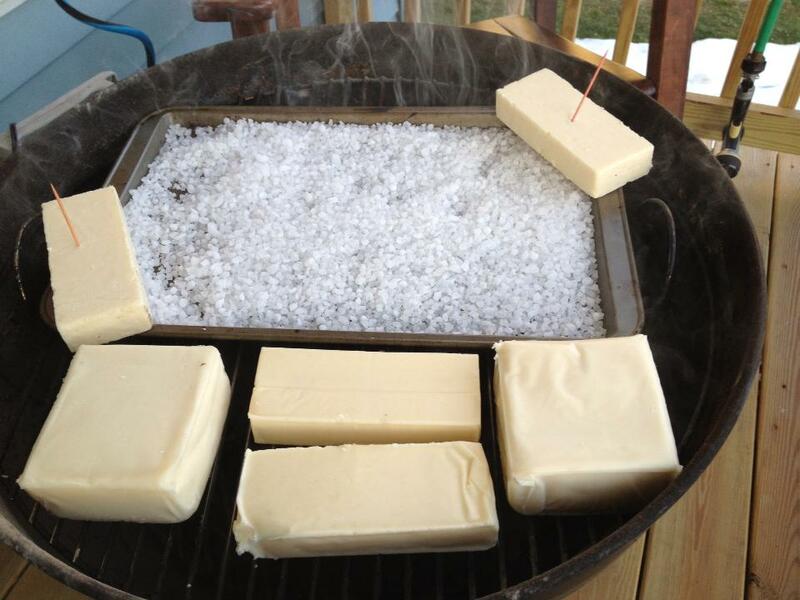 If you read my Ribs 101 post you probably already know I love smoking food and for years I wanted to try my hand at cold smoking so I could create smoked cheeses, lox, nuts and salts etc. Unfortunately, I wasn’t sure about investing in even more, expensive smoking equipment than I already owned just to branch out and experiment. That’s when I learned that if you own a classic, kettle-style charcoal BBQ grill and you have about 25.00 bucks in extra cash- you can make your own cold smoker!! Yes, you can! I can show you. That’s it. The soldering iron I linked to was is about 18 bucks but I found them as cheap as 15 bucks at a local True Value plus 4 dollars for wood chips and 3 bucks max for a can of tomato juice (if you don’t have one you’ve already emptied and used). Even if you had to buy a grill that’s under a 100 bucks and you get a quality, portable charcoal grill to boot. 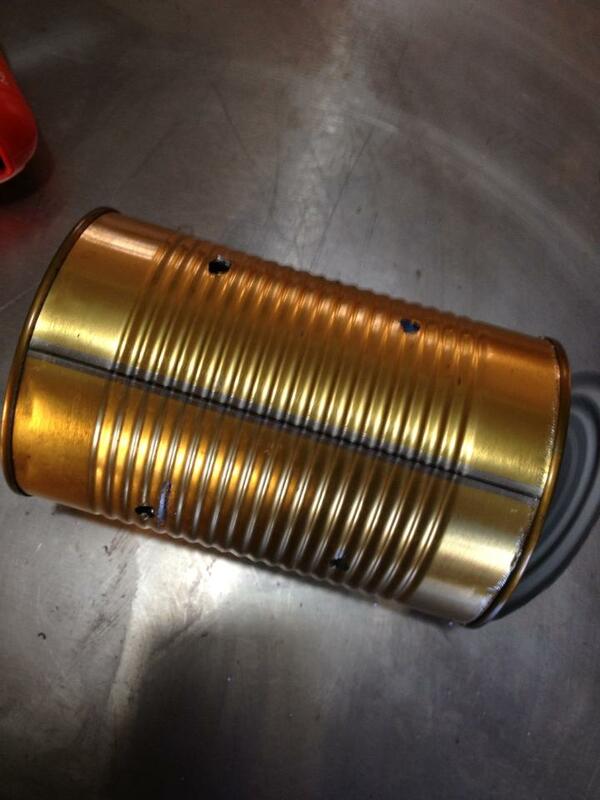 Okay so first we want a large tin can with the lid still connected by a small piece of metal so you can “open” and “close” it. Next you’ll want to make sure it’s cleaned out and maybe bake it at 400F for 30 minutes or so to burn off any shellacs or finishes you don’t want smoking into your food. 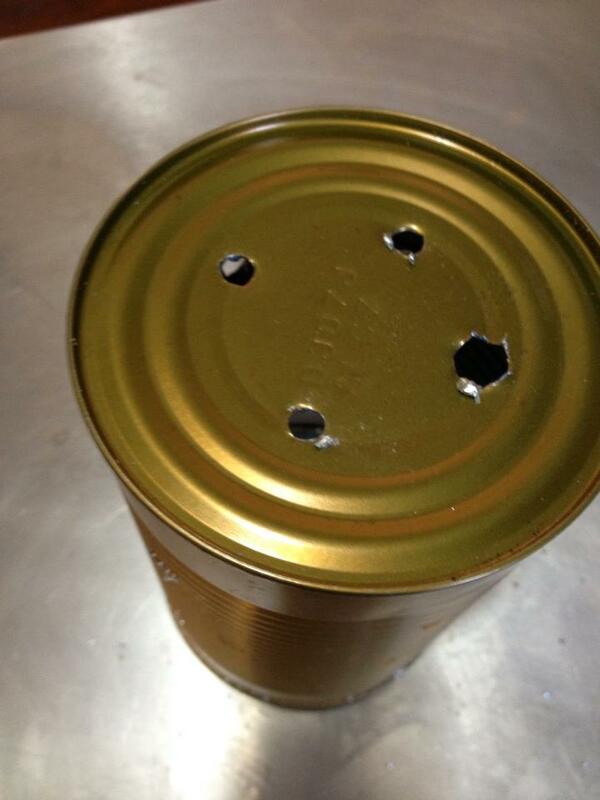 Once you’ve prepped your can you want to drill some holes in the back end and on its side. You’ll notice one of the holes in the back is larger than the others, this is so you can fit the metal, iron-tip of the soldering iron into the can which is essential to this project. 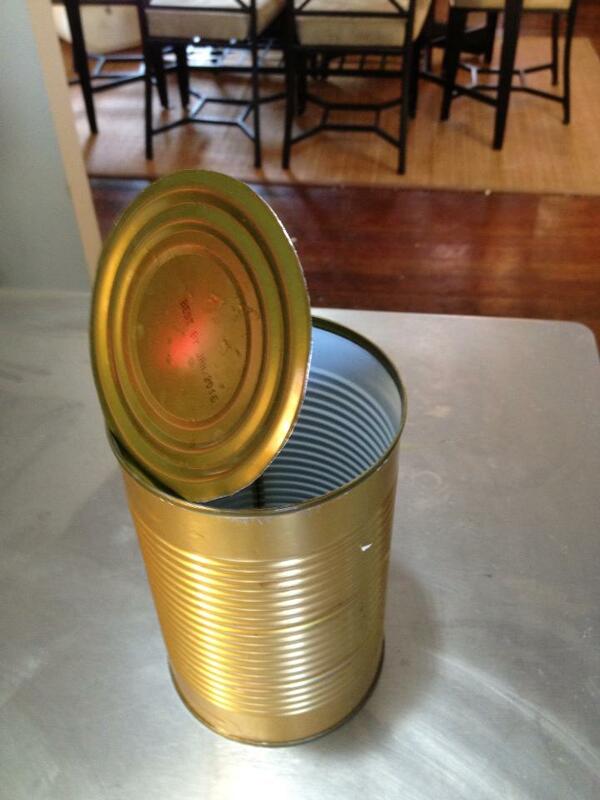 If you want to drill the holes the same size, that’s fine but make sure the soldering iron will fit through one of the holes in the back of the can, see below. 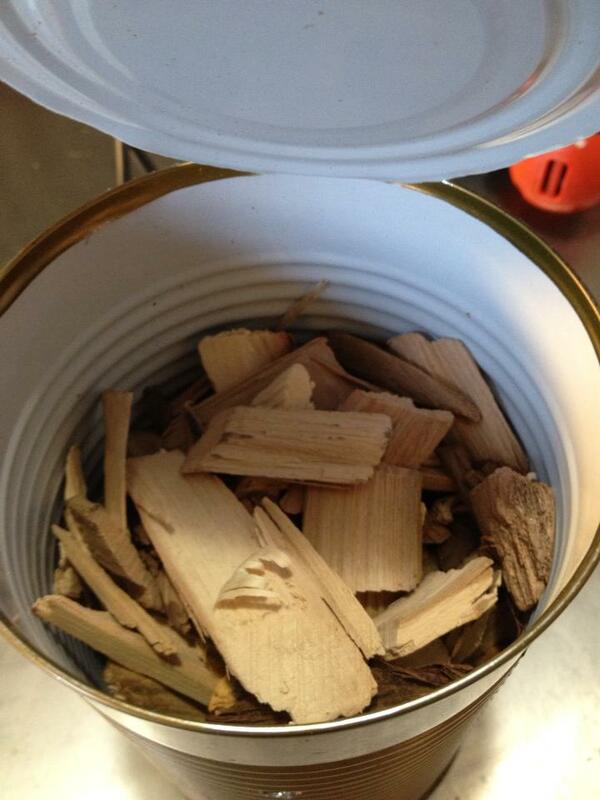 Next pack wood chips around the soldering iron tip in your can. 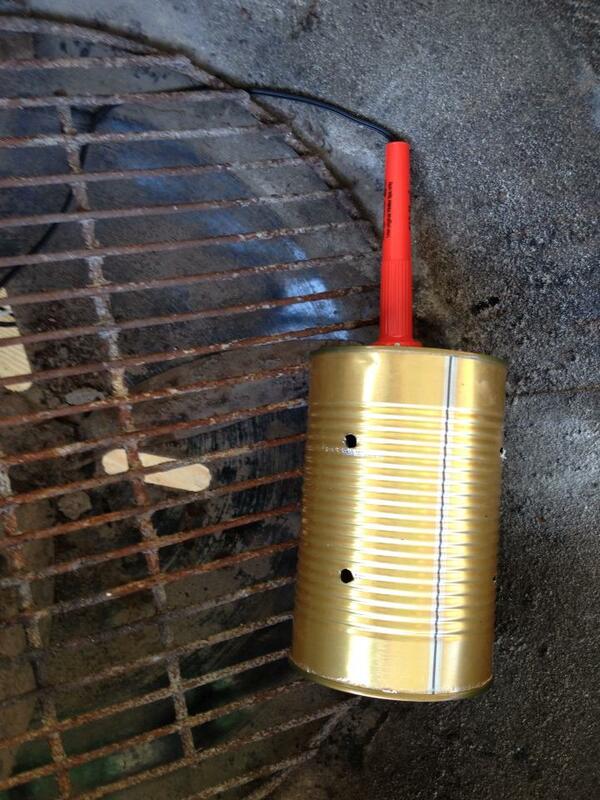 Swing your lid shut on the can and now you’re ready to place your make-shift smoke chamber into the bottom of your kettle grill (where you’d ordinarily put the charcoal. You’ll want to run the cord of the soldering iron through the ash vent in the bottom of the grill so you can plug into a convenient outlet or extension cord, see below. At this point you just plug in the iron, put your food grate on top of it and arrange your food over it. 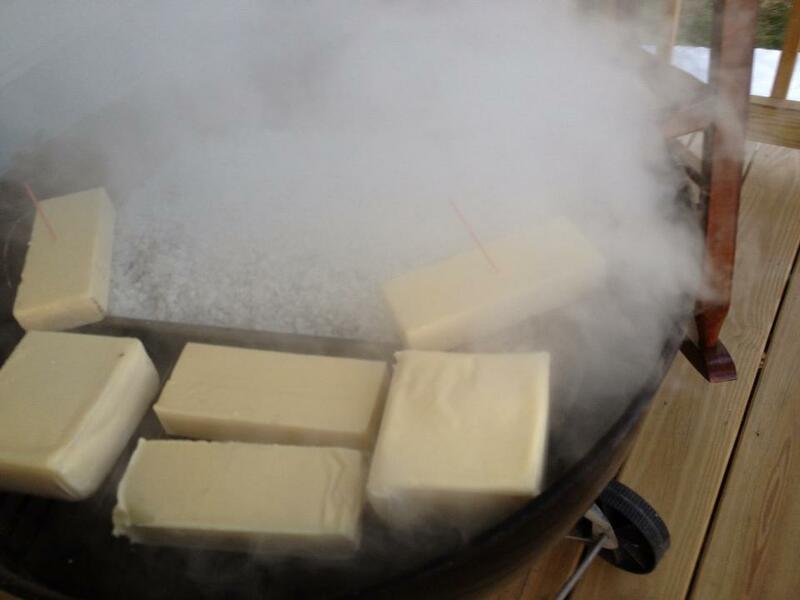 It will begin producing smoke within 5 or 10 minutes and which point you can cover the grill and leave it to fill with smoke. Did I mention this thing generates a LOT of smoke. The smoke WILL warm the grill chamber about 10-20F so it’s not terribly practical to use for meats in the heat of summer days but in the cool of morning or evening or in the fall, winter and spring I smoke lox with it all the time (when cold smoking fish and meats if the chamber can’t get hotter than 75F or you’ll ruin the product). I’ve also noticed that a can of chips will smoke for about an hour and 2 hours is usually ample smoke for almost anything from cheddar, to lox, to nuts and salts. Anyway, if you’re interested in experimenting with cold smoked cheeses and other foods I hope this will be a cheap way for you to get started!